First published in The Bison on the occasion of the 90th anniversary of the founding of the North West Mounted Police and now updated for reprint on the centenary of the Force. The Province of Manitoba has associations with the Royal Canadian Mounted Police that cannot be claimed by any other province. One hundred years ago the first detachment of this famous force, then known as the North West Mounted Police, was mustered at Lower Fort Garry and there the first three troops were billeted during the winter of 1873-1874. The first oaths of allegiance were administered and affirmed at the Lower Fort; there the first warrants of service were issued, and there, in December 1873, the first patrol in the history of the force set out to apprehend whiskey-traders on the west shore of Lake Winnipeg. In the following year the detachment moved from Lower Fort Garry and at Dufferin, the Boundary Commission Headquarters near Emerson, established their own barracks. There at Fort Dufferin, for the first and last time, the entire force was domiciled as a single unit, and from this point the epic march to the foothills of the Rockies was ordered forward. In 1870, Prime Minister Sir John A. Macdonald, composed a memorandum outlining “The nature and composition of a police force for duties on the western plains.” He had in mind a mounted unit with a total strength of two hundred. The recruits would sign on for three years, their rate of pay being 50¢ per day. In addition, they would be provided with rations, lodgings, and a clothing allowance. At the expiration of three years service the men who chose to remain in Western Canada would be eligible to receive a land grant. Having regard for the national complexion of the force, Sir John recommended that fifty men who could speak both French and English should be recruited in eastern Canada. The balance would be taken on strength at Red River. Sir John’s proposal languished through a long probationary period, and it was not until three years later that a Bill “Respecting the Administration of Justice and the establishment of a police force in the North West Territories” was tabled in the House of Commons. The Bill for the creation of “The North West Mounted Police” was given Royal Assent on 23 May 1873. On the same day a Bill was passed in the House providing for the enactment of laws and the appointment of stipendiary magistrates in the North West Territories. The original policy of the North West Mounted Police, embracing the objectives under which it would operate, took into account several conditions which had arisen in the west following the admission of Manitoba into the Confederation of Canada in 1870. The Red River Uprising had passed without clash of arms and the new province was outwardly calm, but the Indians and Métis were restless on a number of counts: insecurity of land tenure, the growing pattern of agricultural settlement, and the disappearance of the buffalo. In addition, in the far west, the American liquor traders, with an indiscriminate lust for profit, were producing widespread debauchery among the Plain Cree and Blackfoot and other minor tribes. In such a setting one spark ignited by an irresponsible chief might start a conflagration in which besotted braves would plunge into open rebellion and bloodshed. Briefly stated, these conditions reflect the original objectives of the North West Mounted Police: (1) Stop the liquor traffic among the Indians, (2) Gain the respect and confidence of the Indians, (3) Teach them respect for law and order, (4) Collect customs duties. On 22 October 1873, the first and second troops, recruited in eastern Canada, arrived in Winnipeg, from whence they were taken to the Lower Fort in horse-drawn sleds. Later the same month the third troop marched from Winnipeg to their headquarters on the Red. On 3 November the oath of allegiance was administered to all ranks and warrants of service were issued. In the opinion of this writer, this day, 3 November 1873, at Lower Fort Garry, Manitoba, marks the real beginning of the North West Mounted Police (R.C.M.P.). Prior to this date disenchanted recruits could have broken away from the service without incurring the penalties of desertion. After the administration of the oath, however, they were bound for service under authority of the Army Act. North West Mounted Police evening guard parade. As the troops knuckled down to winter training it became obvious that some were unfit for duty. 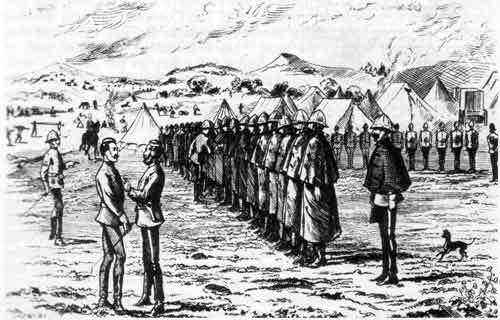 The surgeon reported that a score of men would have to be released on medical grounds, and the Commissioner, Lieutenant-Colonel G. A. French, feared that “as many more would have to be discharged for misconduct.” As he assessed these moral and physical casualties, he became convinced that the recruiting in eastern Canada had been done too quickly and too loosely. In future he would insist on higher admission standards. Anyone who failed to come up to snuff would not be accepted for service. With an eye to securing well trained and well disciplined recruits, he proposed visiting Britain where he hoped to recruit a dozen or more men from the Royal Irish Constabulary. “These,” he said, “would provide leaven for the present unleavened mass.” He did not make the trip overseas, but the recruits he gathered in the new City of Winnipeg, gave him a solid core of disciplined troops, for most of these men had served with Colonel Garnet Wolseley in the Red River Expeditionary Force and had remained at Red River to try their fortunes there. These Westerners together with the best of the eastern recruits were moulded during the winter into a compact well disciplined unit. Early in December 1873 word reached the Lower Fort that renegade white men were selling whiskey to the Indians on the west shore of Lake Winnipeg, (probably in the vicinity of the present Winnipeg Beach). The response was immediate. One sergeant and three constables set out to bring the miscreants to justice. The small patrol set out on snowshoes. Their tents and blankets were lashed to two horse-drawn sleds, and personal duffle, food, cooking utensils, arms and ammunition were lashed on two dog sleds. It was apparently a relatively uneventful trip for the party returned unscathed to the Lower Fort on the day before Christmas with the whiskey traders in custody. The first patrol in the history of the North West Mounted Police had been successfully completedin Manitoba. During the winter the Commissioner turned his thoughts to the location of a site for a permanent barracks in Manitoba. The Lower Fort was under temporary allocation to the force by the Hudson’s Bay Company and new quarters would be required in the spring. The Commissioner and his staff favored a location in southern Manitoba close to the line of March that the troops would take to the west. They intended to follow the path of the Boundary Commission which had been struck in the previous year. The work of the Boundary Commission was over; the international border had been marked from David Thompson’s old marker at Lake of the Woods to the Rockies, and the Commission’s headquarters at Dufferin were available. Both the site and the premises would be suitable for a N.W.M.P. barracks. Arrangements were subsequently completed for securing the Dufferin site, and on 7 June 1874, A, B, and C troops moved off from the Lower Fort to their new headquarters. Five days later D and E troops were on the march. By the middle of the month the entire force was assembled at the new barracks. The officers and staff were housed in the permanent buildings, the men were under canvas. The horses were corralled nearby; the beef cattle grazed on open pasture. The weather was warm, thunder showers were frequent, and swarms of mosquitoes pestered men, horses and cattle. The first evening at Dufferin, now to be called Fort Dufferin, was hot and sticky. As the night drew on storm clouds gathered and a heavy down-pour of rain, and hail, accompanied by high winds, beat upon the barracks and grounds. The storm uprooted tents, overturned wagons, and swept miscellaneous articles far beyond their original resting places. As the storm gathered head a bombardment of lightning and thunder struck the area. 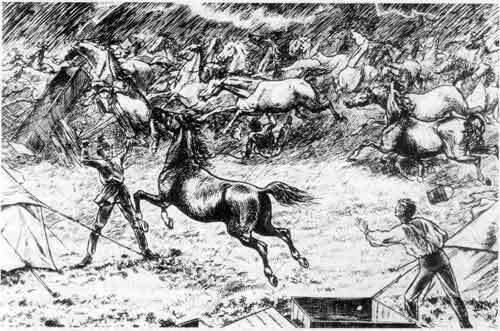 Terrified horses snapped their halter ropes, broke through the loosely constructed corrals, and bolted for the open prairie, racing away from the storm, south into Dakota Territory. Several days were lost in rounding up the horses as some had wandered thirty to fifty miles below the border. When at last the horses were corralled again at Fort Dufferin, it was discovered that every one of them was a mount from eastern Canada. Not a single western cayuse had bolted during the storm. Stampede of the horses at Fort Dufferin. To overcome this exasperating delay preparations for departure were rushed forward. Each day was a full one, but the routine tasks were not allowed to interfere with the military regimetroop parades and kit inspections. There were, however, some unavoidable checks which set back the day of departure. The narrow English saddles which had been issued by militia stores in the east cut sores on the broad backs of the western horses, and rusted stirrups, bits and buckles raised ugly welts on many cavalry mounts and draught animals. These defects were quickly attacked by saddlers and blacksmiths, but it took several days of patient filing and sanding to put the faulty pieces in good order. In the meantime the veterinary surgeons applied strong salve to sores and welts, but the afflicted parts took a long time to heal and until the day of departure many horses remained in the casualty lines. Another serious problem was discovered when the armorers opened the cases of revolvers. By some queer quirk of ordnance, they had been tossed into open crates without wrapping or greasing. As a result, firing pins had been creased or broken, sights, triggers and trigger-guards had been snapped, jammed chambers would not revolve, and riflings had become scored and corroded. The salvage operations were long and tedious, but finally sufficient revolvers were put in serviceable condition so that the commissioned ranks could carry effective sidearms as well as the traditional cavalry sabres which had already been issued to them. In spite of these exasperating delays the day of departure drew near. The Métis guides under their leader and interpreter Pierre Leveille of Red River had already reported to the Commissioner. They were ready to move off on command. Leveille was a huge man who carried his 300 pounds on a tall, muscular frame. His excessive weight immediately posed the problem of securing a horse sturdy enough to carry him without faltering. But Leveille had brought his own mountsheavy-boned Indian cayusesthat had been well broken by their hefty master. The Métis guides were to render invaluable assistance to the “Mounties,” and while riding on the flanks or scouting in the van, their horses stood up to the strain without loss or harm to a single animal. Before leaving Fort Dufferin the first pay parade was posted since the eastern troops had left Toronto. It was a thin payday by modern standards. Each officer received $24.00 and each man pocketed $10.00 “on account.” But contrary to the established order of things on a regimental payday, there were some A.W.O.L.’s. A few men had succumbed to the pull of whiskey “joints” and bordellos south of the international border, and some kept on going never to rejoin the force. The route from east to west would pass south of the present towns of Rosenort, Snowflake, Cartwright, Lena, Wakopa, Coulter and Lyleton. On the first day out of Fort Dufferin only three miles were covered. A halt for the night was called on the shore of a small lake which has since dried up and succumbed to tillage. On the following day the pace was quickened somewhat and in the late afternoon the Pembina Hills were breached. On 12 July, the vanguard reached the Pembina Depot of the Boundary Commission, about twelve miles south of Morden. Grasshoppers plagued the men and played havoc with horses and cattle. A heavy thunder shower added to the general discomfort. But the next morning dawned bright and clear, and taking advantage of the break in weather, the troops marched through until 8:00 p.m. Their stopping place that night was Devil’s Creek, a small tributary of the Pembina, about 59 miles west of Fort Dufferin. Some draught horses had already faltered and could not go on, and the freight wagons and Red River Carts were lagging far behind. Two days later the troops forded Badger Creek south of Cartwright and pressing on halted for the night at White Horse Creek. The day’s march covered twenty-six miles. The following day broke cool and clear and they rose early and made twelve miles before breakfast. That night after a hard day’s march they camped at Turtle Mountain, 130 miles west of Fort Dufferin. They were close to the site of the present International Peace Garden. The next morning dawned hot and humid. The supply wagons were still far behind the main column and the troops pressed forward on half rations. That night they camped about ten miles south of Deloraine153 miles west of their starting place. They broke camp at 4:00 a.m. next day. The heat was oppressive; the oats were gone, and many horses were dropping from exhaustion.